An undocumented woman with a brain tumor has been picked up from a Texas hospital, reports The New York Daily News. Sara Beltran Hernandez was taken from Texas hospital Wednesday night by Immigration and Customs Enforcement (ICE) to the Praireland Detention Center, which is operated by the private prison company Emerald Corrections. A spokesperson from ICE said that Beltran Hernandez was stable and was voluntarily discharged by her doctor to the private facility, pending an appointment with a specialist. Her family members, who live in New York, have worked hard on a petition for her asylum case. They were able to obtain Beltran Hernandez's medical records, but have no say over her medical care. We will keep you up to date on this case as new information is released. 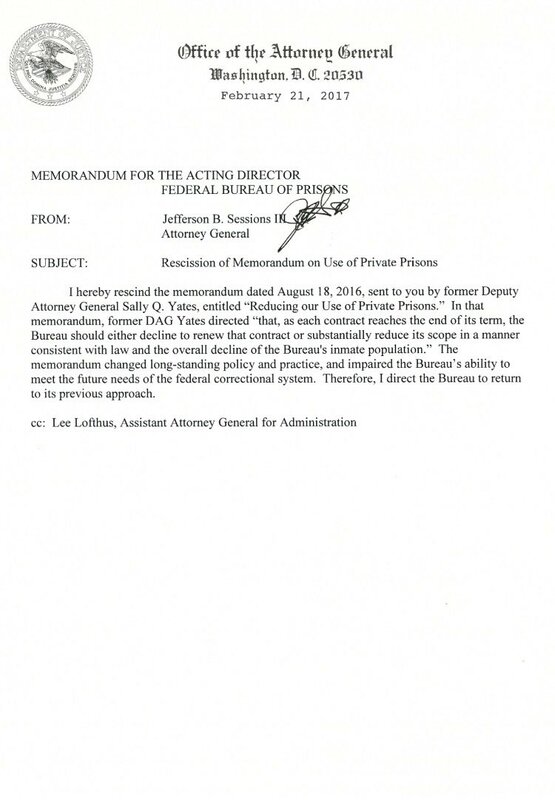 The Department of Justice's new Attorney General, Jeff Sessions, has issued a new memo rescinding last summer's decision to phase out the use of private prisons. According to Rewire, Sessions instructed the Bureau of Prisons on Thursday to once again rely on private prisons. Last August, former Deputy Attorney General Sally Yates issued a memo saying that the BOP would begin phasing out the use of private prisons and would not renew any contracts that were being reviewed. This statement followed a review by the Department of Homeland Security into the conditions of private prisons and whether they were still productive or necessary. Following the announcement, stocks in private prison companies dropped dramatically. However, with a new attorney general and an increase in raids against undocumented immigrants, private prison companies stocks have increased as President Trump looks to expand detention centers around the country. Some groups however, view the policy reversal as suspicious. According to the Intercept, the GEO Group, one of the largest private prison companies in the U.S., made two large contributions to Trump's Presidential campaign. CoreCivic (formerly Corrections Corporation of America) donated $250,000 to Trump's campaign. Grassroots Leadership’s Executive Director Bob Libal in a statement cited Sessions’ announcement as yet another act by the Trump administration that undermines criminal justice reforms and civil rights for incarcerated people. “This administration appears to be more interested in lining the coffers of its friends at private prison corporations than promoting common sense policies that would reduce the incarcerated population and close troubled prisons,” Libal said. The GEO Group, one of the largest private prison companies in the US, has just brokered a deal to expand their brand even more. According to Reuters, the GEO Group spent $360 million dollars in an all-cash transaction to acquire Community Education Centers (CEC), another private prison company which also operates in Texas. The report states that GEO will integrate CEC into GEO Corrections & Detentions and GEO Care, which will give GEO Group an even stronger hold on private prisons here in Texas. The transaction is set to increase GEO Group's total annual revenues by approximately $250 million. Facilities operated by Community Education Centers have faced multiple lawsuits and allegations of sexual abuse. Guards from the facilities have also been sentenced to jail for bribery and indicted for attempting to bring drugs into the facility. While some may think that CEC being bought by GEO may lead to improvements in care & how facilities are run, it is highly unlikely. Facilities run by GEO Group have experienced prisoner escapes, inmates committing suicide, and have faced lawsuits for the mistreatment of prisoners. GEO Group was even indicted in the murder of one of their prisoners who was scheduled to be released four days before his death. Some people may think that changing names or companies can improve a situation, but it doesn't help if the underlying issues of private prisons are not taken into account. A new agreement between Limestone County and the U.S. Marshals Service will help fill the county's privately run detention center, reports KWTX 10. LaSalle Corrections, the Louisiana-based private prison company that operates the facility, signed a new contract with Limestone County last summer to take over operations of the facility. Due to the facility being closed for a few years, LaSalle said it needed to renovate the facility before the company could bring in prisoners from nearby counties. The facility then reopened when the first group of 17-year old prisoners from Harris County transferred to the facility. County Judge Daniel Burkeen said officials are "the most encouraged in years" that the facility will be filled once again. A group of prisoners were recently brought to the newly reopened facility last Friday, though numbers of prisoners at the facility are still low. Staff at the facility are currently working to renovate empty buildings so they can be ready for future use. The facility has the capacity to detain 1,000 prisoners. County Judge Burkeen then said that the agreement with the U.S. Marshals Service will also open the door for immigrant prisoners detained by Immigration and Customs Enforcement to be detained at the facility. The detention center in Limestone County has had various operators over the years, with both Community Education Centers (now owned by GEO Group) and Management and Training Corporation having been in charge of the facility at one point. Immigration and Customs Enforcement (ICE) has quietly been increasing the number of migrant families in their detention facilities in South Texas, reports The Monitor. The number of migrants who are processed through ICE and released locally has dropped significantly, according to the Sacred Heart Immigrant Respite Center in McAllen. Less than a month ago the center saw around 300 migrants a day, with the center now averaging about 90 people per day. People from the respite center and RAICES believe that the number is based off of the number of beds available in Karnes or Dilley family detention centers, which hold primarily Central American mothers and their children seeking asylum. Last December, a judge in Austin ruled that the two facilities could not be licensed as child care facilities. During the time of the ruling, there were about 1,700 people in Dilley and 600 in Karnes. RAICES, which provide pro bono legal services at the two centers, said the numbers are now closer to 2,000 in Karnes and 700 in Dilley. A temporary Customs and Border Protection processing center near the Donna-Rio Bravo Port of Entry may also increase the number of migrants ICE can process. By adding an additional processing center, ICE has another facility to process individuals arriving at the border before they are transferred to a different, permanent detention center. This processing center adds to the 12 detention centers already located south of San Antonio. These, like Karnes and Dilly, are operated by for-profit prison companies that contract with the U.S. government.